More than just speed, it will provide better performance, from stadiums to your own home. Wi-Fi Alliance visuals for device manufacturers. Wi-Fi 1 would have been 802.11b, released in 1999. Wi-Fi 2 would have been 802.11a, also released in 1999. Wi-Fi 3 would have been 802.11g, released in 2003. Older versions of Wi-Fi aren’t widely in use and aren’t officially being branded. Wi-Fi 4 is 802.11n, released in 2009. Wi-Fi 5 is 802.11ac, released in 2014. Wi-Fi 6 is the new version, also known as 802.11ax. It’s scheduled for release in 2019. 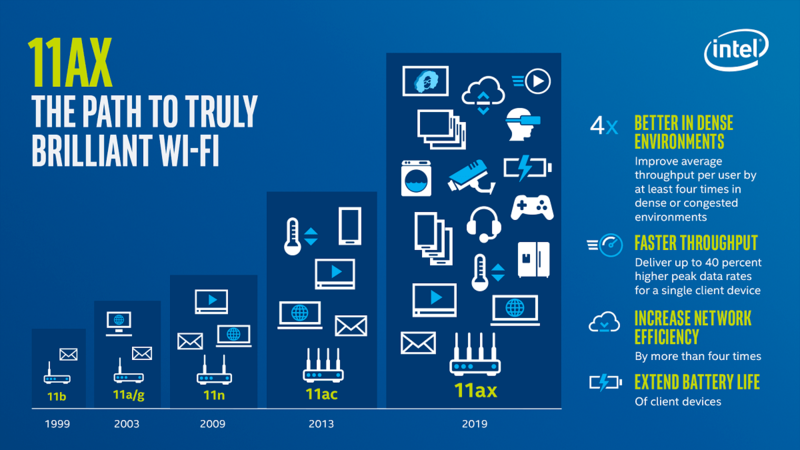 The Wi-Fi Alliance also announced would like to see these numbers appear in software so you can tell which Wi-Fi network is newer and faster when connecting on your devices. You may be seeing Wi-Fi numbers on your phone, tablet, or laptop soon. The latest Wi-Fi standard will offer faster data transfer speeds. If you’re using a Wi-Fi router/AP with a single device, maximum potential speeds should be up to 40% higher with Wi-Fi 6 compared to Wi-Fi 5. Better Performance in Crowded Areas. You will also start seeing a “Wi-Fi 6 Certified” logo on devices that have gone through the Wi-Fi Alliance’s certification process. Previously, there was a “Wi-Fi Certified” logo but that didn’t tell you what generation Wi-Fi that product was from unless you looked at the specifications.